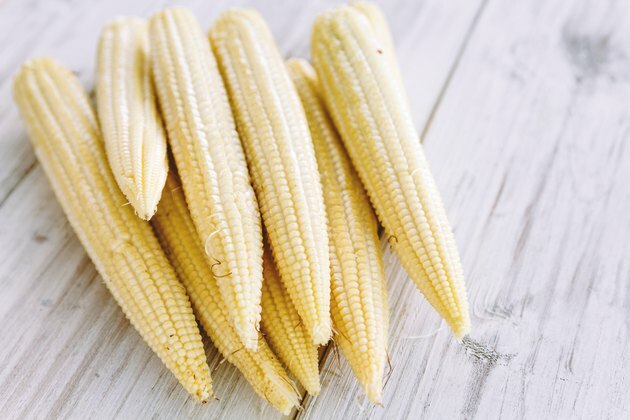 You might think because of its size that baby corn is grown from mini corn plants, but it's actually just regular corn that's been picked before it's matured. Most of the baby corn found in the United States is canned and has been imported from Asia. While corn is considered a starchy vegetable because of its carb content, the nutritional values of baby sweetcorn are closer to those of a nonstarchy vegetable. Plus, it's a good source of essential nutrients that help keep you healthy. Baby corn is a low-calorie vegetable with 25 calories per 1/2-cup serving, according to the U.S. Department of Agriculture. By comparison, 1/2 cup of regular corn, which is considered a starchy vegetable, has more than 60 calories. Baby corn has a calorie content that's similar to that of other nonstarchy vegetables such as broccoli, cauliflower and green beans. As a low-calorie food, baby corn can fill you up without costing you too many calories, making it a good choice if you're trying to lose or maintain a healthy weight. As with calories, baby corn has a lower carb count than that of regular corn but is still a good source of fiber. A 1/2-cup serving of baby corn contains just 5 grams of carbs — versus 13.5 grams in 1/2 cup of regular corn kernels — along with 3 grams of fiber. Getting more fiber in your diet offers a number of health benefits, including a lower risk of heart disease and Type 2 diabetes, according to the University of Maryland Medical Center. Fiber in foods such as baby corn also helps keep you feeling full and has been associated with lower body weights. A 1/2-cup serving of baby corn contains 1 gram of protein and zero grams of fat. Both protein and fat are essential nutrients, but if you eat a variety of foods, you should be able to more than adequately meet your needs. It's recommended that you get 10 to 35 percent of your calories from protein and 20 to 35 percent of your calories from fat. Protein is needed to make new cells, and fat acts as a source of energy. As a canned food, baby corn is a source of sodium in the diet. A 1/2-cup serving of baby corn contains 300 milligrams of sodium. If you're concerned about the sodium content, you may be able to find fresh baby corn at your local farmer's market. Too much sodium in the diet may raise blood pressure and cause fluid retention. The U.S. Food and Drug Administration suggests that your daily intake of sodium should be less than 2,300 milligrams a day. Rinsing canned mini corn prior to consumption helps to reduce sodium content. According to the U.S. Department of Agriculture, baby corn is nutrient-rich, providing vitamin A, vitamin C and iron in your diet. As essential nutrients for your immune system, both vitamins A and C help your body fight off infection. Your body also needs iron to transport oxygen from your lungs to the rest of your body. What Vitamins Are in Corn?